For our latest Community Spotlight, we chat with Deckhand Mike (also known as Mikez within the community) about his role in the group, his Sea of Thieves experiences so far, his deep gaming history and his brush with celebrity. Take it away, Mike! A confident looking captain if we ever saw one. [A]: I first started gaming on my stepdad’s ZX Spectrum (bit of a deep cut) but I soon progressed to the Sega Mega Drive, PlayStation, N64 then eventually found my home on the Xbox and within the Xbox community. Gaming is a great escape for me and as I’ve grown up it's become more of social platform where I hang out with friends I've made all around the world. [A]: I was indeed a fan of Rare's games before Sea of Thieves! I have many fond memories of playing GoldenEye and Diddy Kong Racing in split-screen with friends after school. Also, can't forget those relaxing times tending to my garden in Viva Piñata! [Q]: What was it that first drew you towards Sea of Thieves? [A]: The very first E3 trailer had me hooked on the idea of an open sea to explore and adventures to embark upon with friends. Destiny had my full attention at the time but I was open to something new to really dig my teeth into and I was buying what Sea of Thieves was selling. With a fine looking ship to boot! [Q]: When did you first become a Deckhand, and what is it like to take on the role? [A]: I was made Deckhand about three months ago now. It was exciting but also a bit nerve-racking at the time! I was already helping out unofficially in the Xbox Club but being a more official voice within the community carries with it a bit of extra weight and responsibility! [Q]: Previously our Deckhands have been exclusively for the Forums, but now branch out and moderate our Club too. Are there any differences between moderating the Forums and Club communities? [A]: Well, within the Club there is a live chat section which is always open and available to anyone in the Club. So, as you can imagine the pace is usually a bit quicker making responses and answering the community’s questions! I prefer the more instant response and being able to chat a bit more openly with the community in a live environment. The Xbox Club also has the Looking for Group feature built right into the platform making it much easier to advise people who are looking for like-minded players to join up with. [Q]: Having now played Sea of Thieves, do you have any standout moments? [A]: There have been so many standout moments with this game. From joining forces with random crews to take on Forts and Krakens, epic multi-ship battles at sea, to setting up monthly self-made challenges with other friendly crews. But honestly the moments that stand out the most for me are the people, and friends I've made along the way. I've met and talked with some honestly amazing people in this community and these friendships wouldn't exist if it wasn't for this game. One person I know in particular will be a lifelong friend. She is my pirate partner in crime and I am eternally grateful that this game made this and other friendships possible. [Q]: Now that Sea of Thieves has released, how has that impacted your responsibilities as a Deckhand? [A]: With the release of the game there has been a large influx of new members to the community. The Forum Deckhands have felt the change the most I feel as there are so many new topics coming up day by day! As we have started a new Xbox Club for launch it is a bit quieter than it used to be for now, but once we start ramping up I'm sure my day to day on there will become busier once more! There will be weekly competitions (for fun) starting soon on there as well, so look forward to those! Earlier this year Mikez visited along with several other Deckhands. What a crew! [Q]: What's your greatest achievement in any game, Sea of Thieves or otherwise? [A]: Greatest achievement in ANY game. That's a tough one. The one thing that does come to mind though was when I finally defeated the Sephiroth boss encounter in Kingdom Hearts II. Anyone who has experienced this and overcome it knows the struggle and feeling of satisfaction after beating it! [Q]: As a gamer, is there anything that you feel you've learned about the hobby since becoming a Deckhand? [A]: After becoming a Deckhand and having a little bit more of a peek behind the proverbial curtain, I've learnt that game development/community management is not as easy or simple as it seems from the outside! I have definitely learnt that you can't please everyone but the sheer amount of positive vibes from this community are unlike anything I've come across in all my years of gaming. It really helps to keep things together! [A]: In its current form the game already delivers a great experience where you make your own fun with the tools/features provided. It's about you, your friends and the strangers you meet on the way creating your own stories and legends! I am just looking forward to more features and more tools to create even more fun situations with friends and have even more stories to tell! [A]: Mike the Marauder! But you guys have already kindly given me my own pirate name which I love! Lord Lloyd! 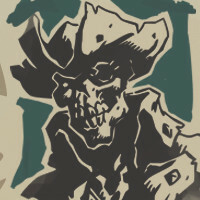 Look for me when you next take on a skeleton Bounty Voyage. [A]: I'm an avid film buff so re-watching classics that I love or going to see the new releases in the cinema with friends. I also enjoy going on long cycling trips when the weather suits it! [A]: Fun fact... it turns out I'm very fragile! On separate occasions I have managed to break both of my wrists and have had the same corrective surgery on both. I have the matching scars on both wrists for life! It never stopped me though, I still ended up putting myself into very questionable situations whilst my wrist was supposed to be healing! But both wrists still working and mostly intact. I also once met the now famous singer-songwriter, James Bay! (Before he was a big deal.) I stood a few feet away from him in a tiny jazz club whilst he played a free set for the night just to promote himself. If I knew how popular he was going to be, I probably would have hung on to all the free CDs and merch he was just giving away! Now we can officially say that we (sort of) know James Bay by association. Is that how this works? Either way, another great read about another Sea of Thieves community star! A big thanks to Mike for taking the time to chat to us and even more so for his support as a Deckhand and Sea of Thieves fan. That’s it for our latest Community Spotlight, but if you’re looking to read up on our pantheon of spotlighted community pirates then head on over to our dedicated category page. Finally, don’t forget that you can also keep up to date on the latest from Sea of Thieves via our social channels.